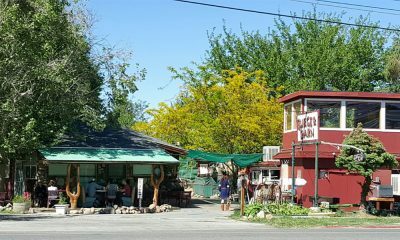 It’s not unusual for temperatures to climb to and over the 100-degree mark during the summer months in Bishop. And, yes, there’s that wonderful and oft repeated phrase, “But it’s a dry heat.” Well, that’s true and it does make it a little more bearable, but for those who really need an escape, there are a great many options. Water is the essence of life. Here in the Bishop it’s also a way to keep cool during the hot high-desert summers. In fact, there’s plenty of water. It cascades down the mountains and flows along in cool, clear streams and spreads out into ponds and lakes. One wonderful pond situated just few miles from Bishop is Millpond Recreation Area. This is a perfect place to bring the whole family for a fun day of wading and swimming, picnicking and playing, and lying on the soft green grass under a shady tree. There are gazebos with tables and barbeques, a kids’ playground and it’s an awesome place for a big ol’ family bash. Gazebos may be reserved for special events. A sparkling blue pool with water slide and diving board is located in the heart of Bishop Park. The Bishop City Park Pool is a convenient, fun and safe place for kids of all ages to splash about or swim some laps. Public swim times are Tues – Fri: 1:00 – 4:45, and Sat & Sun: 1:00 – 5:00. General admission for public swim is $4 for children and $6 for adults. Download the 2017 pool schedule here. 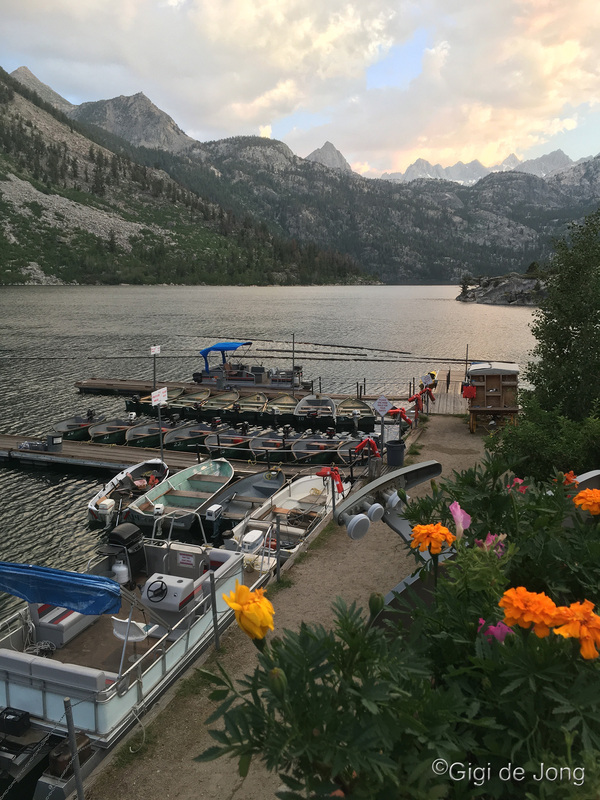 Situated at a little higher elevation, precisely 5,000’ higher, is the lovely Lake Sabrina (locals pronounce it “Suh-bry-na” – no one really knows why) where you can swim, paddleboard, or rent a boat or pontoon for a day on and in the water. By the time you reach this gorgeous lake you’ll already be much cooler. Temperatures here are 20-30 degrees lower than in the valley and it’s only the incredible view that will take your breath away. Where there’s water there’s fishing, and none so wonderful as the streams and lakes of the Eastern High Sierra. Bishop Creek Canyon is the jewel in the crown of Bishop’s outdoor activities. It is the nearest gateway to the John Muir and Pacific Crest Trails. It offers world-class fishing with one of the most accessible and handicap accessible fishing spots in the area – Intake II. This is a small lake on the road up to Lake Sabrina where the fishing is ridiculous (ridiculously easy) and the setting is sublime. 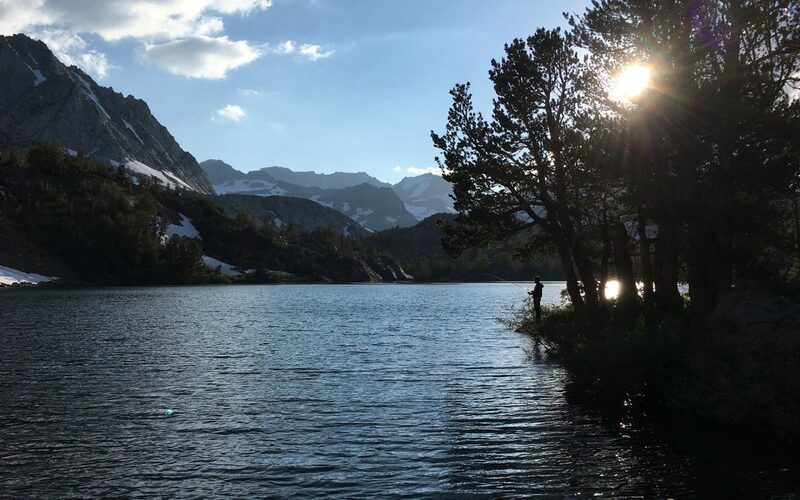 Besides Intake II, Bishop Creek Canyon has more opportunities for lake fishing and stream fishing than you can shake a fishing rod at. There’s fishing in Lake Sabrina, at South Lake, in North Lake, in the ponds between the lakes, and in the dozens of lakes just a few miles from the trailheads that begin at these lakes. There’s a latticework of creeks and streams between the lakes and … well, you get the picture. Chill out, go fishing and be rewarded with a bounty of beautiful fish – or just cool your jets. It’ll be worth it. 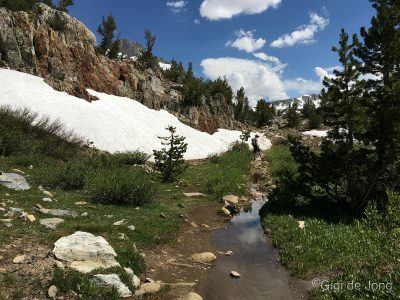 Summer hike in the Eastern Sierra – way cool! So the cool water in the high sierra is just a little too chilly for you, and the fishing just isn’t your thing. Then take a hike! Hike the magnificent trails of the Eastern High Sierra. Within less than a mile from many of the trailheads in Bishop Creek Canyon you can be in the John Muir Wilderness. Isn’t that cool? Or, you can take a drive to the Ancient Bristlecone Pine Forest and go commune with the old ones. 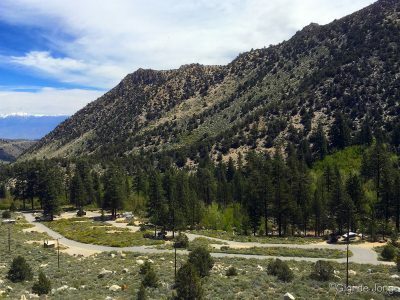 High above Bishop in the White Mountains is the Schulman Grove Visitor Center where you can see and learn about the world’s oldest living non-clonal organisms. Hike the 4.5-mile trail through the Methuselah Grove where, unmarked to protect its identity, lives Methuselah which is 4,847 years old. Just two years ago an older tree, unnamed and also unmarked, was determined to be 5,065 years old. It sprang to life in the year 3051BC and for over 5,000 years it has lived on this cold, rocky mountaintop. This really is one of the coolest things you can do. Early in the morning and later in the evening is when it’s especially wonderful in town. The beauty of a hot Bishop summer is being able to wear your shorts and t-shirt and a pair of flip-flops for breakfast, lunch and dinner. 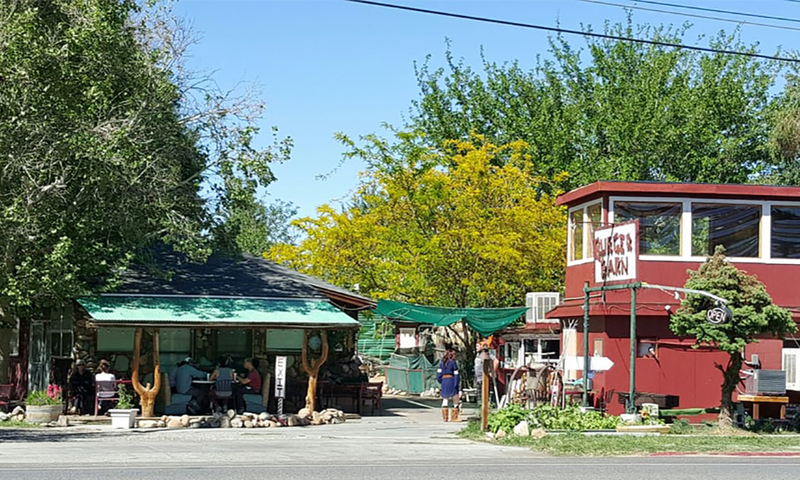 Enjoy a meal in one of Bishop’s excellent eateries – particularly those with outdoor seating and watch the sunrise or sunset in your most comfy, casual clothes. Nights are coolest in every sense of the word in Bishop. Camp out under the stars in a bivvy bag, or pitch a tent by a burbling stream. There is free dispersed camping available in many locations around town and there are more than 20 campgrounds in our big backyard. Take your pick of one of 21 great lodging facilities for a night in a bed with indoor climate control to get you refreshed and ready for another day of exploration in the Eastern High Sierra. Swim. Fish. Hike. Eat. Sleep. Repeat. Eastern Sierra Transit services all these great places, including a twice-daily shuttle up Bishop Creek Canyon, so you can run around town and up to the mountains without breaking a sweat. Find out more about Dial-a-Ride and the shuttle at estransit.com. 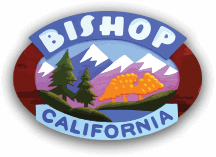 Call or stop in at the Bishop Visitor Center at 690 N. Main St., (760) 873-8405 to get all the coolest information on what to do and where to go. 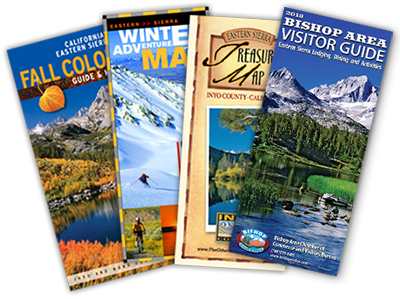 The friendly, knowledgeable staff can supply maps, give you directions, and get you set up for a super cool vacation in the Eastern Sierra.